Jamie Lindsay was stretchered off against Hibernian. Ross County’s management team were last night celebrating the capture of one of their main summer targets after Jamie Lindsay arrived on a permanent deal from Celtic. 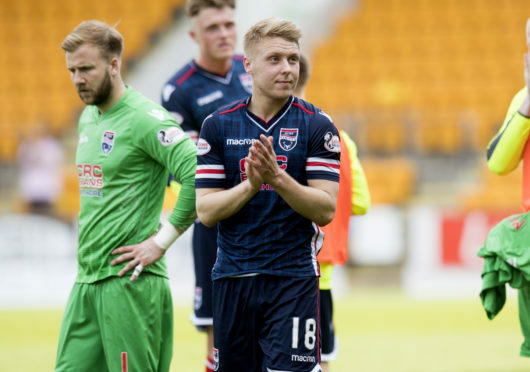 Last season’s Dingwall loanee ended nearly a decade’s youth and senior service with the champions after County paid an undisclosed fee for the remaining year of his Celtic contract. The 22-year-old was high on the list of priorities for co-managers Steven Ferguson and Stuart Kettlewell, with Ferguson describing him as exactly the type of player they want at the club. Lindsay, brought in by Jim McIntyre last summer, made 32 appearances for County, scoring twice, in what was his first action in the Premiership after previous loan spells at Dumbarton and Morton. Ferguson said: “Stuart and I are delighted we’ve managed to get Jamie on a permanent deal, having watched him throughout his time on loan at Ross County. He played such a big part in the final 10 games under Stuart and I and we had Jamie as a real priority signing in terms of building a team for next season. “There was no certainty he would be at the club beyond the end of this campaign, but you could see how much he put into our battle to stay up. That’s exactly the profile of player we want at the football club. Talks on Lindsay’s future stretched to three weeks, with Ferguson admitting: “These things are never entirely straightforward and there is a lot to go through until you get to this stage. “But thankfully we managed to navigate through what we need to. Jamie is our player now and we just feel he has a really bright future and can play a pivotal part in everything we’re trying to do next season. As well as the fee remaining undisclosed, County declined to say how long a deal Lindsay had signed. Lindsay becomes County’s third new signing of the close season so far, joining ex-Caley Thistle playmaker Iain Vigurs and former Livingston winger Josh Mullin.